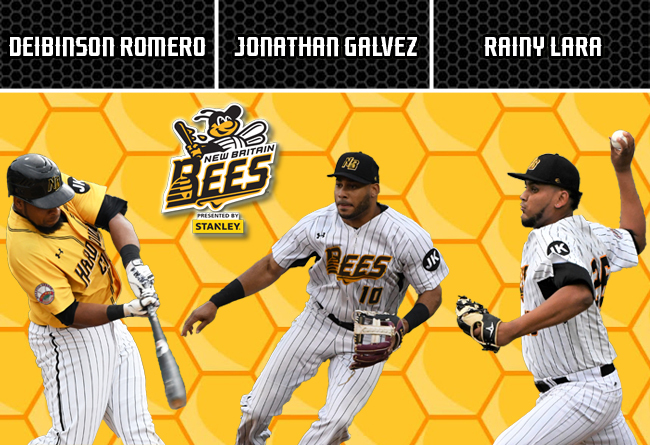 (New Britain, Conn., Feb. 26, 2019) – The New Britain Bees today announced the signings of infielders Deibinson Romero and Jonathan Galvez, and pitcher Rainy Lara. Deibinson Romero returns to the Bees for his second season in the Atlantic League and 14th of professional baseball. Last year, the infielder played in 120 games for New Britain, and collected a .255 batting average with 71 RBI and 61 runs scored. The slugger also ranked second in the Atlantic League with 27 doubles and fourth with 18 home runs, while being named to the Liberty Division All-Star team and taking home the Home Run Derby title at the All-Star game. The 32-year-old began his professional career in 2006 within the Minnesota Twins organization. He spent nine years in the Twins farm system, reaching as high as the Triple-A level in both 2013 and 2014. This also included a two year stint playing in New Britain Stadium with the Rock Cats from 2011-12, where he posted career highs of 19 home runs and 78 RBI in 2012. The slugger also spent time with both the Pirates and Yankees organizations in 2015 and 2016, respectively. In 1,201 career minor league games, Romero owns a .262 batting average with 123 home runs, 655 RBI, 598 runs scored, and a .349 on-base percentage. Jonathan Galvez returns to New Britain for his fifth season in the Atlantic League and 12th of professional baseball. Last year with the Bees, he posted a .277 batting average with 10 home runs, 47 RBI, 50 runs scored, and 12 stolen bases, while being named to the Liberty Division All-Star team. Prior to coming to the Hardware City, Jonathan spent three seasons with the Bridgeport Bluefish, including an impressive 2017 campaign, where he batted .277 with 16 home runs, 27 doubles, 77 RBI, 68 runs scored, 10 stolen bases, and a .351 on-base percentage over the course of 126 games played. He also represented the ‘Fish and the Liberty Division in the 2016 Atlantic League All-Star Game. The 28-year-old began his professional career in 2008 within the San Diego Padres organization. He spent seven years in the Padres farm system, reaching Triple-A in both 2013 and 2014. The slugger also spent time with both the Mets and Yankees organizations in 2015. In 1,074 career minor league games, Galvez owns a .277 batting average with 91 home runs, 542 RBI, 601 runs scored and 153 stolen bases. Rainy Lara returns to the Bees for his 10th season of professional baseball and third in the Atlantic League. Last year with New Britain, he posted a 9-7 record with a 3.63 ERA with 81 strikeouts over the course of 124.0 innings of work, while being named to the league’s All-Star team for the second season in a row. In 2017, the righthander made his Atlantic League debut with the Bridgeport Bluefish and was named to the Liberty Division All Star team. In 25 starts, he earned nine victories with a 4.31 ERA and 97 strikeouts across 142.0 innings pitched. The 27-year-old made his professional debut in 2010 with the New York Mets organization in the Foreign Rookie-level Dominican Summer League. Prior to joining the Atlantic League, he had been in the Mets farm system for the entirety of his career, reaching the Triple-A level in both 2015 and 2016. In 181 career minor league outings (157 starts), Rainy owns a 62-52 record with a 3.76 ERA and 667 strikeouts in 908.0 innings pitched.